This beautifully illustrated leaflet is an advertisement for Chas Baker and Co's clothing store. In the 19th century an increase in sporting activities began to influence male fashions. The formal suits of the 1800s were heavy and impractical and were very uncomfortable to wear whilst cycling, fishing and yachting for example. Looser and more adaptable clothing was worn, for example, in contrast to the stiffly starched shirts of the early 1800s, soft collared shirts began to be made from flannel and short jackets were worn with lighter trousers. 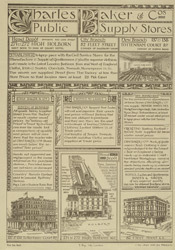 A large department store like Baker's would have stocked a large range of clothing suitable for any activities in which a gentleman should wish to partake.